Fingers Drinking Game was submitted by Chris from Australia. Fives Drinking Game was submitted by Kit Chun from Hong Kong. Fingers, a great game that can be played in a bar where you’re able to buy beer in jugs… Or any drink in jugs actually. You play until the jug is finished. It’s a game that can go on for a LONG time if you’re unable to bow out and say thank you for playing with a straight face. Fives is very similar that was submitted by Kit Chun from Hong Kong… No jugs or empty glasses needed but you’re guessing in multiples of 5 up to the number of fingers in play. Definitely a great game to get the party started nicely. A great game for the pub or bar! Place a pint glass in the middle of the table and pour a little bit of everyone’s drink in there. Everyone now places a finger on the top of the glass. Going round clockwise you say a number, which will be between 0 and the number of players remaining in the game, For example, if there are 5 of you playing then you’d say a number between 0 and 5. Now AS THE NUMBER IS SAID you will either lift your finger off the glass or keep it on the glass. There must be no hesitation. If the person who guessed how many fingers would be left on the glass is correct they are out of the game. If they are wrong, they are still in the game and places their finger back on the glass. If you are wrong you must also drink. However, if you guess correctly you must first thank the group for playing fingers with you. If you laugh or smile as you are thanking the group then you are back in the game again. The thank you must be elaborate. For example “I’d like to thank everyone for playing fingers with me tonight. I had a lot of fun and I would love to play with you all again soon.” Something to that effect. Everyone else can try and put the person off and try to make them laugh. The last person remaining must drink the entire contents of the pint glass. Fives is very similar to fingers except there is no pint glass. Instead, you all sit around in a circle with your arms out in front of you with your hands clenched into a fist. Going clockwise you need to guess how many fingers will be showing. 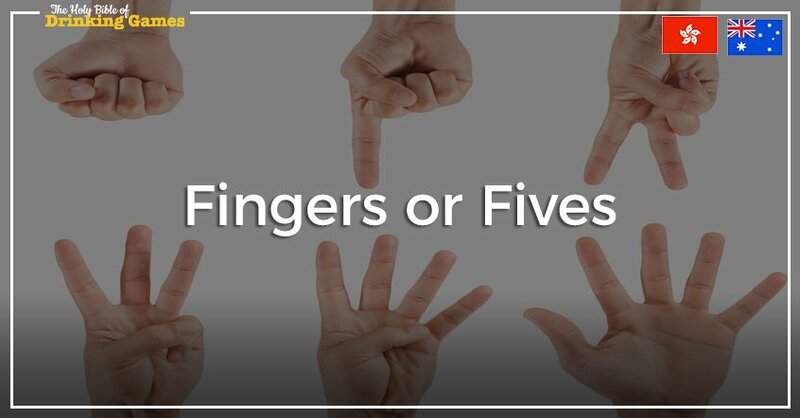 You will be guessing in multiples of 5 as you will either open up your hand with all 5 fingers showing or keep your fist clenched. For example, if there are 3 of you playing and you are using both arms you’ll either guess 0, 5, 10, 15, 20, 25 or 30. You must open up your hand AS THE PERSON GUESSES or keep in closed. No hesitation here either. If you guess correctly you are out. If you guess incorrectly you must drink and you are still in the game. If you’re the last person remaining you take 5 fingers of your drink. Place one finger on a cup in the middle of the table. The cup should be filled with a bit of everyone’s drink. At the same time the player guesses, everyone must either remove their finger or leave it on the cup. This must be done AT THE SAME TIME as the person says their number. NO HESITATION. If the person guessing is wrong, they drink and are still in the game. If they guess right, they’re out of the game. BUT FIRST, they must thank everyone for playing fingers… Needs to an elaborate thank you. If they smile or laugh whilst saying thank you, they take one drink and are still in the game. Trying to make them laugh is encouraged! Last person left downs the entire cup in the middle. Same as fingers, but no cup and you use your whole hand and guesses are in multiples of 5 up to the number of fingers in the game, e.g. If there are 4 players the guesses would be 5, 10, 15, 20, 25, 30, 35, 40. If guessed wrong, the player drinks. If correct they are out. The last person standing takes 5 fingers. If there are more than 3 people playing just use 1 fist each instead of both.